DESCRIPTION: This beautifully presented one bedroom first floor apartment originally constructed by Linden Homes is set within a small development within the very popular and requested area of St Johns. This particular home has many features including gas central heating via radiators, double glazing, a kitchen complete with built in dishwasher, fridge/freezer, washer/dryer, electric oven and hob. The master bedroom has built in wardrobes, the bathroom has a contemporary white suite and there is an allocated parking space to the front. Possibly the property's most notable feature is its south facing balcony accessed through patio doors from the living room and providing the perfect spot to drink your morning coffee as you contemplate plans for the rest of the day. As these homes are popular amongst first time buyers and investors alike, we have no hesitation in recommending an early appointment to view. SITUATION: The property is set within the heart of the desirable St Johns area of Tunbridge Wells which itself has become a vibrant and busy centre with its selection of bistro's, restaurants, metro supermarkets and shops. For the commuter traveller there is a choice of railway stations at either High Brooms or Tunbridge Wells town centre, both offering fast and frequent services to London Bridge, Cannon Street in under the hour. Recreational facilities include a selection of local parks, golf, cricket and rugby clubs, Tunbridge Wells sports and indoor tennis centre on the St Johns Road, whilst on the outskirts of the town there is access to the surrounding countryside as well as the Knights Park leisure and retail complex with its multi screen cinema, ten pin bowling complex and private health club. ENTRANCE HALL: Central heating thermostat, power points, single radiator, coats cupboard. Recess storage cupboard with light and shelf, adjacent airing cupboard with light, shelf and water reserve tank. PRIVATE BALCONY: Benefiting from a southerly aspect. 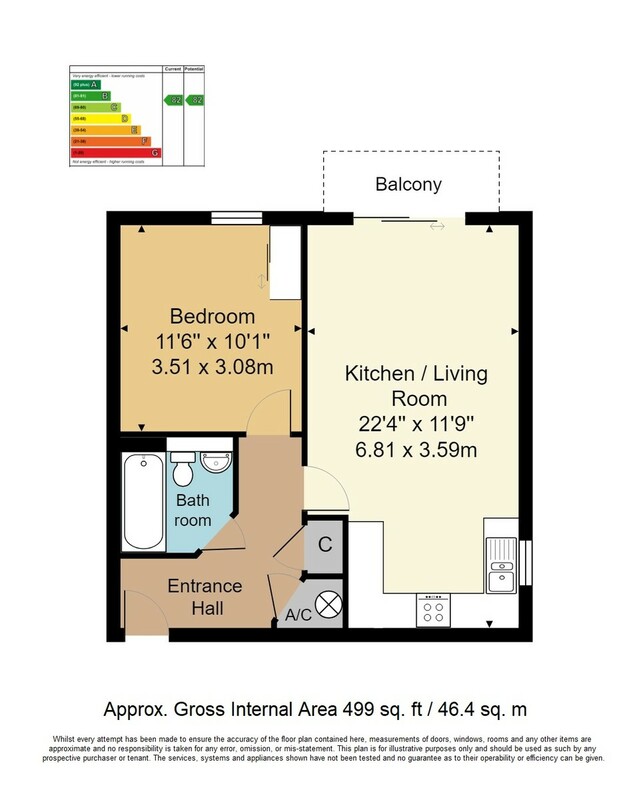 BEDROOM: Full height window to front, power points, built in double wardrobes with mirrored sliding doors, single radiator. BATHROOM: White suite comprising of a panelled bath with mixer taps, shower spray, tiled shower area and glazed screen, low level wc, wall mounted wash hand basin with mixer taps, tiled surround, heated towel rail/radiator, extractor fan, shavers points.